Edward Prescott, the 2004 Nobel Laureate in Economic Sciences, has joined NYU Stern for the 2005-2006 academic year as the Shinsei Bank Visiting Professor in Economics at NYU Stern's Center for Japan-US Business and Economic Studies. Prescott, the W. P. Carey Professor of Economics at Arizona State University's W. P. Carey School of Business, is working with colleagues in the economics departments of both Stern and the NYU College of Arts and Science. In March of 2006, Prescott and Stern's Japan Center hosted a conference on savings and the Japanese economy. 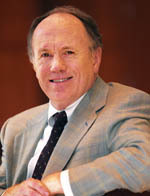 Prescott, who has held teaching positions at Carnegie Mellon University, University of Chicago, University of Minnesota, and University of Pennsylvania, is the author of more than 100 articles and is noted for his contributions to the theory of economic development and growth, banking, and financial markets, as well as to business cycles and tax policy. He shared the 2004 Nobel Prize with Finn Kydland of Carnegie Mellon University for their contributions to dynamic macroeconomics, specifically the time consistency of economic policy and the driving forces behind business cycles. 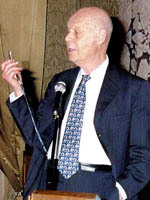 In 2003, Prescott received the Erwin Plein Nemmers Prize in economics. He is currently a fellow of the American Academy of Arts and Sciences and the Econometric Society. John H. Biggs, the former chairman and chief executive officer of pension fund giant TIAA-CREF, was appointed executive-in-residence at NYU Stern as well as executive fellow in the Executive MBA program for the 2005-2006 academic year. This appointment extends Dr. Biggs' engagement with the School, where he served as NYU Stern's Citigroup Distinguished Fellow in Leadership and Ethics for the 2004-2005 academic year. Dr. Biggs, who received his PhD in economics from Washington University in St. Louis, spent more than 20 years at TIAA-CREF, the nonprofit financial institution that invests on behalf of employees of universities and other nonprofits. A Fellow of the Society of Actuaries, he currently serves on a number of corporate boards, including Boeing, where he chairs the audit committee, and J.P. Morgan Chase. He is also the chairman of the board at the J. Paul Getty Trust and at Emeriti, a nonprofit organization offering post-retirement medical benefits to college faculty. In November, The Ewing Marion Kauffman Foundation awarded NYU Stern’s Berkley Center for Entrepreneurial Studies a three-year, $735,000 grant to support and stimulate research on innovative entrepreneurship. This prestigious grant will fund the NYU Stern Berkley Center/Kauffman Foundation Entrepreneurial Project, to be led by William J. Baumol, Harold Price Professor of Entrepreneurship and Academic Director at the Berkley Center. The grant was one of many recent honors for Baumol, who is renowned for his research on entrepreneurship in economic renewal and growth. Last fall, he was inducted into the Accademia dei Lincei, the the oldest scientific academy in Italy. And the annual meeting of the American Economic Association in Boston in January featured three sessions in Baumol's honor – as well as an exhibition of his paintings. In January, Oxford University Press published a new book by Roy Smith, Clinical Kenneth Langone Professor, and Ingo Walter, Seymour Milstein Professor of Ethics and Corporate Governance and Strategy. In Governing the Modern Corporation: Capital Markets, Corporate Control, and Economic Performance, Smith and Walter trace the evolution of corporate governance over the past century to reach an understanding of how the system failed so horribly in the 1990's. They note that the professionals involved in running corporations and the financial system – executives, investment bankers, analysts – were hampered by deep-seated conflicts of interest. And they argue that politicized regulators also failed to perform as expected. Smith and Walter conclude that all agents involved in the markets, from investors to executives, must do a better job at being accountable for the fiduciary obligations they hold to shareholders, clients, and investors. Thomas Sargent, William R. Berkley Professor of Economics and Business, was recently named president-elect of the American Economic Association (AEA). As president-elect, Sargent will oversee a variety of the association's activities, including organizing its annual meeting and supervising the publication of the AEA's many academic journals. Sargent, who joined Stern in 2002 from Stanford University, is an advisor to the Federal Reserve Banks of Minneapolis, San Francisco, and Chicago. His current work involves developing models to understand persistently high European unemployment rates, and using new statistical methods to characterize the changing behavior of the Federal Reserve since World War II and the responsiveness of the US economy to its actions. Nicholas Economides, NYU Stern professor of economics, continues his research in telecommunications and technology. His working paper, “Quantifying the Benefits of Entry into Local Phone Service,” co-authored with Katja Seim and V. Brian Viard of Stanford University, quantified the savings reaped by New York State consumers due to competition in local telecommunications services between 1999 and 2003. Extrapolating the results nationwide, the authors concluded that the annual consumer benefit was $1.1 billion, until regulatory and legal decisions in 2004 killed the competition. His other paper, “Two-Sided Competition of Proprietary vs. Open-Source Technology Platforms and the Implications for the Software Industry,” co-authored with Evangelos Katsamakas (PhD '04), of the Fordham University School of Business, was published in Management Science. Among other results, the paper found that when a system based on an open-source platform with an independent proprietary application competes with a proprietary system, the proprietary system is likely to dominate the open-source platform industry, in both market share and profitability. This finding may explain the dominance of Microsoft in the market for PC operating systems. Assistant Professor of Marketing Justin Kruger has been delving into the psychological implications of our growing reliance on e-mail. In “What You Type Isn't What They Read: The Perseverance of Stereotypes and Expectancies Over E-mail,” Kruger and Nicholas Epley of the University of Chicago Graduate School of Business showed that racial stereotypes and bogus expectancies influence people's impressions more strongly over e-mail than in voice interactions. The article was published in the Journal of Experimental Social Psychology. In addition, his research paper, “Egocentrism Over E-Mail: Can We Communicate as Well as We Think?” co-authored with Epley, Jason Parker, and Zhi-Wen Ng of the University of Illinois, appeared in the Journal of Personality and Social Psychology. The article argues that people may overestimate their ability to communicate effectively through e-mail, in large part because the difficulty in conveying tone and emotion online may make it difficult for recipients of e-mail to appreciate the messages being sent. Martin Gruber, Nomura Professor of Finance, was elected to the board of directors of the National Bureau of Economic Research (NBER), the nation's leading nonprofit economic research organization dedicated to promoting a greater understanding of how the economy works. The NBER's board of directors includes representatives from the leading US research universities and major national economics organizations. The NBER's past researchers include 16 of the 31 American Nobel Prize winners in economics and six of the past chairmen of the President's Council of Economic Advisers. Gruber will serve as the American Finance Association's representative on the NBER. Richard Sylla, Henry Kaufman Professor of the History of Financial Institutions and Markets, became president of the Business History Conference, at its annual meeting in Minneapolis in May 2005. Sylla will give his presidential address to the association of US and international business historians at its meeting in Toronto, Canada, in June 2006. Professor of Economics William Greene is co-investigator (as an expert in econometrics) of a major research project at the NYU College of Nursing. The project, led by Christine Kovner of the College of Nursing, will study newly-licensed nurses in order to track changes in their careers, and was recently awarded a $1.96 million grant from the Robert Wood Johnson Foundation. John Asker, assistant professor of economics, was among the eight scholars who received the 2005 Young Economists' Essay Awards from the European Association for Research in Industrial Economics. Asker received the award for his paper, “Diagnosing Foreclosure Due to Exclusive Dealing,” at the association's annual conference in Oporto, Portugal. Luís Cabral, chair of Stern’s economics department, delivered the closing plenary session at the conference. Anindya Ghose, assistant professor of information systems, received the second-place prize in the 2005 ACM SIGMIS Doctoral Dissertation Award for the best dissertation in the field of information systems at the International Conference on Information Systems. Ghose's dissertation, "The Strategic Impact of Electronic Secondary Markets on Firm Performance, Market Structure and Social Welfare," examined the impact of Internet-based used-good markets on book publishers, retailers, and consumers. In October 2005, Baruch Lev, Philip Bardes Professor of Taxation and director of the Vincent C. Ross Institute of Accounting Research, gave a presentation entitled, “The Art and Science of Valuing Intangibles and Managing Reputation,” at the International Sustainability Leadership Symposium in Zurich. Held once every two years, this prestigious conference was attended by approximately 250 corporate executives, policymakers, non-governmental organizations, and consultants.